When getting a basketball, you think it may be a simple thing to do but in fact, you will need to consider a few aspects. Buying a Best Outdoor Basketball can apply to playing on a gym floor or on the pavement as an example. Other aspects will be buying a basketball for a child or an adult. These facts may be simple in nature but will make a difference in the end result. If you try to get the best basketball, you will need to verify the authenticity of the ball and who is certifying them. Is it certified by the NBA as an example or just the company itself? Dribbling a basketball, you look for the best basketball capable of having the right bounce. The texture, the smell and the feel of a basketball is important. Many may not think it is important but dribbling a high-quality basketball will display in your mind images of yourself completing splendid layups and killing slam dunks. You will find many types of basketballs on the market from various brands. They range as mentioned above from outdoor street basketballs to the to the fine leather indoor basketball for hardwood gym floors to the ones found in NBA Games. You have to keep in mind that the type of ball used will certainly make a difference when playing the game. That is why it is crucial a buyer should consider how the basketball will be used, meaning outdoor or indoor. It is also important so you don’t end up spending unnecessary amounts of money on the way you will be playing the game. Don’t Forget To Check Out Top 10 Best Portable Basketball Hoops With In Affordable Range. When you look into buying the Best Basketball Sizes, you need to know that basketballs are available in three sizes. The sizes are broken down in three numbers. They are size five, six, and seven. Each size corresponds to a certain age group and gender. As an example, getting a basketball for a child will require a smaller size, therefore the size 5 may be more appropriate. Below, we broke down each size individually and whom it should apply for. The size five basketballs are designed for players up to age 11. They measure 27 ½ inches in circumference and weigh 18 ounces. The size six basketballs are designed for basketball players with an age range of twelve to fifteen-years-old. Size six basketballs are also recognized to be the right size of basketballs for women. It measures 28 ½ inches in circumference and weighs 20 ounces. The size seven basketballs are designed for adult male players over sixteen years-old. Its size is bigger and heavier measuring 29 ½ inches in circumference and weighing 22 ounces. Size seven is the size used by pro basketball players in the NBA. The correct size to choose is very important. The size must match the players who will play with the basketball. Since younger players have smaller hands, it just makes sense they use a smaller basketball. As they grow, their hands get bigger allowing the players to have more control over a bigger basketball. 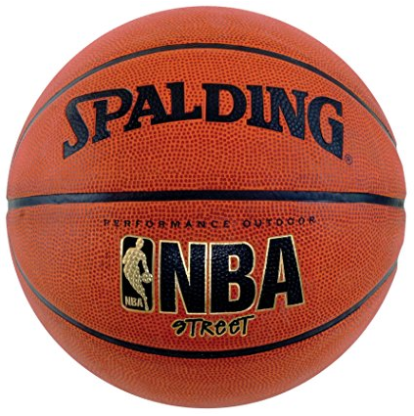 The SPALDING NBA Street Basketball is labeled as one of the best outdoor basketball available. The name of SPALDING synonym of quality is the official brand of the NBA and their name rests on quality and durability. It is perfect for street play. This one only weighs 1.7lbs. and is very durable for street play on pavement. Made with an outer rubber cover, the NBA Street Basketball provides a very high quality grip. Its channel design is designed is aimed at enhancing this solid desired grip each player wants in a ball. Its NBA logo figures prominently on the ball bringing that credibility to your game. measuring 29.5 inches in circumference, it is a size 7 basketball that is identical in size to what the players are using in the NBA. Size 7 with a circumference of 29.5 inches like in the NBA. The SPALDING NBA Street basketball is an excellent investment and would represent the ideal ball for teenagers playing on the street or at an outdoor basketball court. In general despite some exceptions, this basketball performed really well and personally, when we tried it we extremely satisfied with the feel and the dribbling performance it provided. The SPALDING NBA Zi / O Indoor and Outdoor official-size basketball is the perfect ball for the in and out matches. This basketball from SPALDING also features the NBA logo front and center, which sends you this quality message from the get-go. 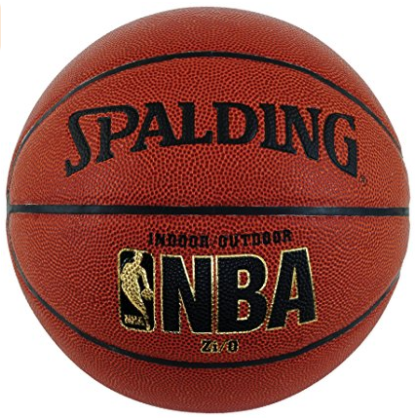 The SPALDING NBA Zi / O basketball uses a Zi / O composite leather cover contrary to the one reviewed above. Its look and feel is just as good as the basketball used by NBA pro players. A foam-backed design coupled with a full ball pebbles design are geared to have your basketball meet any competitive play challenges, whether it is slam dunks or long shots. With a leather soft feel, sending the ball to its wanted spin is much easier on hardwood flooring. What makes this basketball so great is that it can be used indoor (gym) or outdoor (street / parking lots). This SPALDING Indoor/Outdoor basketball meets all the specifications of the NBA, which means it meets its weight, circumference and size. Ball is 29.5 inches as per NBA rules and specifications. Meet all the specifications of the NBA. Product can be used outdoor. Composite leather brings more authenticity to the ball. Weight and size is perfect for both environment matches (indoor and outdoor). More control and spin on the ball. Grip on some of them was not as good as some others. In summary, this basketball from SPALDING for playing either indoor or outdoor is an excellent product. We liked for its versatility and quality. The feel it gives with its composite leather brings this basketball to a whole new level and makes you feel like you are on an NBA court for its performance and handling. The WILSON Evolution Indoor Game basketball is a basketball built strictly for indoor play. Perfect for high school tournaments and intramural leagues, this basketball has all the laid-in channels to assure the control and handling needed in a basketball. It comes game-ready and inflated with its exact amount of air needed for those incredible alley-hoops. The WILSON technology behind this basketball is designed with a Cushion-Core technology. This technology provides the quality bounces needed to execute this perfect play in crucial moments. 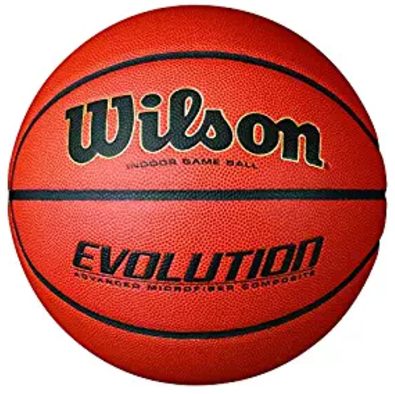 In addition, the WILSON Evolution Indoor game basketball is wrapped with a premium Microfiber Composite Leather Cover, which adds the grip tenacity and smooth control on the hardwood. This basketball meets and is approved for all the specifications of the NCAA and NFHS. It is available in the three basketball sizes (5, 6 and 7). Pebbles composite channels brings ball grip to a whole new level. Like we did for the previous product listed above, we managed to extract some PROS and CONS associated with the WILSON Evolution Indoor basketball. In summary, this WILSON Evolution Indoor basketball was a solid product, which we definitely recommend. The only downside was the fact, we were restricted to indoor play but on the positive side, we were to see the three available sizes for this great basketball. It is a solid product for high schools and colleges play level and its leather feel won’t disappoint you. 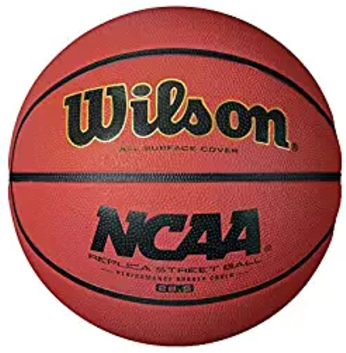 The WILSON NCAA Replica Game Basketball is an excellent basketball if you are looking for a simple basketball aimed at playing in local tournaments or some pick-up after school or work. It is a NCAA replica basketball which will bring some quality to your game, even for a replica ball. It’s made with quality and durability, which is excellent for these rugged surfaces when playing outdoors. If you play indoor, you can also count on this ball to deliver the ultimate performance needed. The WILSON basketballs all have their unique Cushion-Core technology and this one is no exception. As mentioned before, its Core-Cushion technology gives you the feel needed in a basketball with its perfect bounce in dribbling scenarios. With this WILSON NCAA Replica Game Basketball, you can play indoor or outdoor, which gives you more flexibility for play areas. This one is also equipped with its distinguished laid-in channels acting as a moisture-wicking feature. Cutting any moisture allows more grip and control on those sharp pivots. Laid-In channels ensure a reduction of moisture on the ball. Unique Cushion-Core technology provides this genuine feel and steady bounce. NCAA logo displayed on the ball. Ideal for college and high-school players. The WILSON NCAA Replica Game basketball was trialed on a few pick-up games by our staff and we were to get their OPROS and CONS feedback. Here are what they were able to pick up firsthand. We also consolidated some of the best feedback provided by users who purchased the product. Excellent for college and high school levels. Can be used anywhere inside on the hardwood or outside on the pavement. Excellent feel on the outer surface. Excellent grip and control on sudden stops and go. Outer surface wore out fairly quickly on outside plays. In isolated cases, some deflated after a certain period of time. Not all basketballs are perfect and some are inclined to have issues whether they deflate shortly after you buy them or wear out quickly after a few outdoor games. They key is to remember to keep you receipt and if a situation does occur where your basketball is not what you expected, simply request a refund or a replacement. It does happen a basketball by any companies will have defects. In this case, the WILSON NCAA Replica Game Basketball filled most of our expectations and performed nicely. It is a ball you can use in or out and you will have the same quality bounce and control. 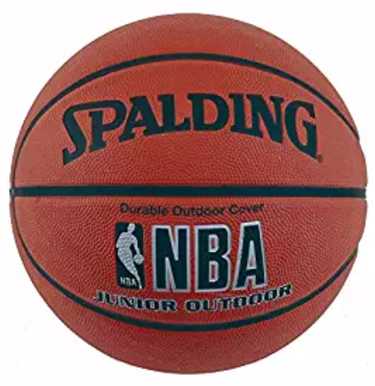 In fifth spot of our best basketball for indoor or outdoor play, we find the SPALDING NBA Indoor / Outdoor Replica Game Ball. This is a size 7 ball with its 29.5 inches NBA circumference specification designed with the same technology found in other SPALDING balls. Manufactured in China, the ball has a cover made of premium composite which gives you this leather look and feel. It has a nice orange color, like the real deal. It features the NBA logo, markings and even the NBA commissioner’s signature bringing more credibility to this replica. The pebbles technology is a nice feature that provides the much needed grip. It is a bit more tackier than its real pro counterpart but still very effective. Good for Outdoor and Indoor games. Although we didn’t have a chance to personally trialed this replica basketball from SPALDING, our extensive research allowed us to consolidate some valuable PROS and CONS for your information before purchasing it. Excellent return on the investment. Long lasting product even with outdoor action. Some of the balls didn’t have the right cover feel (lack of pebbles). Moisture seems to stay on the outer surface cover more. Based on our research, we felt this SPALDING NBA Replica Indoor / Outdoor Game Ball were a good basketball to play outside. It was in general, durable and didn’t wear out too fast. The cost is well worth the investment, if you are an avid basketball player. We recommend this basketball mainly if you plan on playing mostly outdoor. 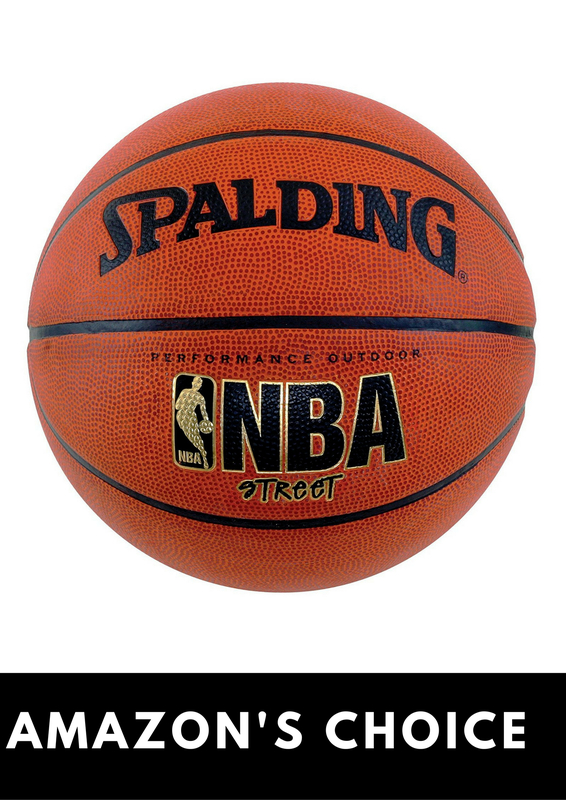 Featured in our sixth spot, we have the SPALDING Varsity Rubber Outdoor Basketball. You’ve guessed it right, it is the best outdoor basketball only. 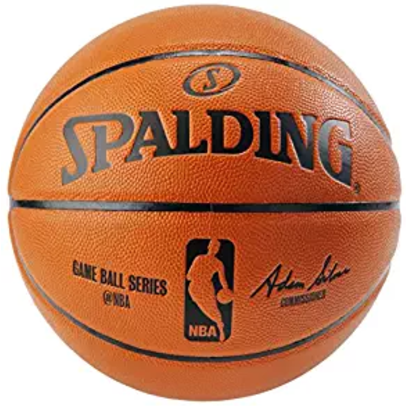 Again, with a SPALDING ball, you get the traditional NBA logo figuring front and center on the ball which adds to its look while providing some credibility to your personal ball. The SPALDING Varsity model basketball is a great ball for the beginners learning the basics of the game and its ball maneuver. Armed with a durable rubber cover, this basketball will produce great pick-up heroes in your neighborhood. It is the perfect basketball to pound on the street and to execute this killing slam dunk. It comes with its normal NBA size, which is size 7 coupled with a circumference of 29.5 inches. Inflated it has a weight of 1.0lbs. Its black channels greatly enhance the grip and control for outdoor play. The SPALDING Varsity Game Ball is complete with an all-surface pebble design. Black channels distribute moisture evenly for more control. NBA logo adds this unique and professional look. Size 7 ball in accordance with NBA ball specifications. In determining the positive and negative aspects of this outdoor basketball, we came to the following results. Durable cover ensures a longer life to the basketball. Price is excellent for the quality. Moisture distribution efficient with the black channels. Perfect for the beginner learning the game on the street. Beware as some balls were slightly distorted when they were received. Tends to deflate after a while so a pump is strongly recommended with this purchase. We thought this SPALDING Varsity Outdoor basketball was one of the best outdoor basketballs on the market. It is durable and despite playing on a hot pavement, it will last a long time. This is a product we highly recommend since we truly liked the price it cost. 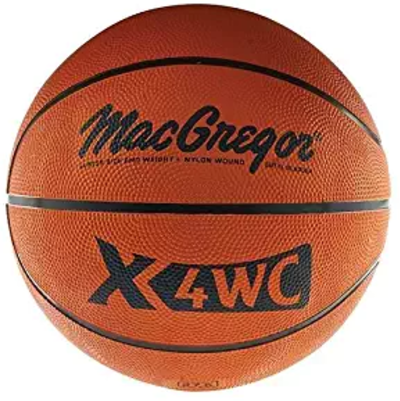 The MacGregor X500 basketball is a bit of an unknown because of its name brand. But nonetheless, this basketball is a great buy for a kid wishing to learn the intricate of playing the game of basketball. Featured in this review, we looked at the X500, which is ball for kid, so the size is different in this case. For this one, we have a circumference size of 27.5 inches or in basketball lingo, a size 5. This one is made of a durable rubber cover and will last for a long time. It is always to care for it by wiping it and monitor its inflated volume for best performance results. It has fairly wide channels which will make the child’s grip easier on the ball. Of note, this Macgregor X500 basketball is an outdoor and an indoor ball. Ideal for gym classes, this ball will become a true favorite amongst children. Junior size 5 and circumference of 27.5 inches. Durable Rubber Cover for more endurance. Wide black channels for a stronger grip and hold. For this one, we didn’t have any children available to trial the Macgregor X500, so we relied on the feedback brought forward by other buyers who gave us their feedbacks. Durable ball and excellent grip for a sure grip. Cost is low and affordable. Balls are sold and delivered deflated so be ready to inflate them when purchasing it. Our take on the Macgregor X500 was that we thought this ball was an excellent starter for a kid willing and enjoying to play basketball. The fact this basketball can be used indoor or outdoor adds to its versatility and increase the areas where the child can play basketball. 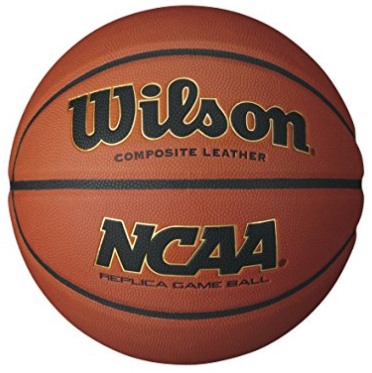 At no.8, we find another WILSON ball with the WILSON NCAA Replica Rubber Basketball. With this one, WILSON went with a rubber cover for the outer layer. WILSON being the official NCAA Basketball, you will again see on the ball the NCAA logo displayed. The logo adds the professional look of the ball. It is an outdoor basketball weighing 1.0lbs. In this review, we are featuring the size 5 which is the junior size with a circumference of 27.5 inches. It has a complete pebble design which will give any child the grip and control needed to enjoy the basic dribbles and passes. This design is combined with black wide channels, which upgrades any ball handling manoeuvres and shots. Solid and quality rubber cover. Wide black channels for enhanced control. Pebble surface for a better feel. In looking at several feedback and comments, we were able to lay down some useful PROS and CONS for the WILSON NCAA Replica Rubber Basketball. Great ball for a child starting to play basketball – easy to handle. Strong rubber cover provides more endurance. We determined when a child is willing to learn to play basketball, the quality of the basketball doesn’t need to be of the highest standard. But in this case, the WILSON NCAA Replica Rubber Basketball delivers on quality and performance. It is a great ball for any kids and teenagers learning to play pick-up games after school. In this ninth spot, we are looking at a different look for a basketball. Leaving the traditional orange color of SPALDING or the usual light brown color by WILSON, we bring you the WILSON Killer Crossover Basketball. This basketball features several color combinations. The combinations are: orange and white, red and white, lime green and white, Carolina blue and white and black and white. It weighs 1.0lbs. and is a size 6 or intermediate ball. It has like any size 6 a circumference of 28.5lbs. 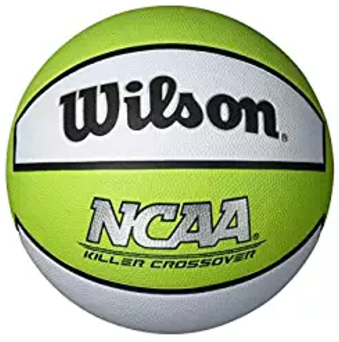 The WILSON Killer Crossover Basketball is an outdoor and an indoor basketball and is perfect for the recreational player wishing to play pick-up games or a more traditional game of 21. Constructed with quality Optima rubber, the cover is durable. designed with its 16-panel cover, this Killer Crossover basketball will bring quality dribbles to the game. Like any products, we found some PROS and CONS associated with this product. Rubber cover is built with quality. Color selection will bring a different look to the game. Perfect basketball for the one playing occasionally. An indoor or outdoor basketball which can be used to play at any given time and anywhere. Balls often arrives after purchase deflated. The WILSON Killer Crossover is an excellent ball for a kid to learn how to play basketball. The colors are a nice feature since kids will often enjoy colorful sports equipment they can play with. Beware in some cases, where this basketball was either totally deflated or was losing air shortly after purchase. We recommend the purchase of a quality air pump to avoid disappointments. Completing our review of the ten best basketballs for indoor or outdoor play is the Baden Elite Indoor Game Basketball. Baden is not as known in the manufacturing of basketballs, but after reading this you may be tempted to check them out. The Baden Elite Indoor Game Basketball is the high-end ball made by Baden. With its Cushioned Control Technology, Baden designed a carcass comprising of tiny air cells. These tiny air cells allow a soft feel and a consistent quality bounce. The 29.5inches basketball has also advanced microfiber in its cover. It guarantees the perfect combination of softness and tack. By not absorbing any moisture with this system, it enables the basketball to have a quality grip throughout a match. The symmetrical panels are wide at the seams to prevent any irregular bounces originating from unwanted lumps. Perfect for college or high school games, the Baden Elite Indoor Game Basketball has a Stealth Soft Valve System. This system is a great feature hiding the valve system during the game. It enables a player to have the same feel all around no matter where the ball is grabbed or handled from. Available for men or women, this ball is easy to handle. It is widely recognized throughout many states and also at the NFHS level. Cushion Control Technology (CCT) carcass provide more durability to the outer layer. Tiny Air Cells give a softer and tackier feel. Wide channels are symmetrically balanced. Stealth Valve System enhance the player’s grip with its undetected valve design. Perfect for high school or college. Getting into the analysis of good and bad things was also retrieved for the Baden Elite Indoor Game Basketball. Below you will find a quick summary of the PROS and CONS on this ball. Quality outer surface provided longer endurance. Grip not as strong around the letterings on the ball. Seams tend to rip early after normal indoor use. 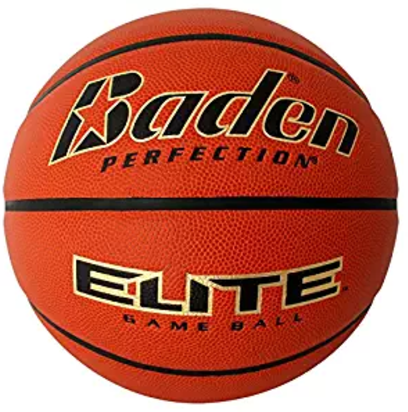 The Baden Elite Indoor Game Basketball is a good ball for high school and college players. It is widely recognized and the feedback received and retrieved was unanimous. It is a great basketball which delivers an excellent grip and very little moisture. Keep in mind some have had issues with seams ripping after a few uses, which has been in isolated cases. When the time comes to purchase a basketball, everybody have their own ideas on which basketball is the best indoor basketball or which one is the best outdoor basketball. Just remember basketballs can be as unique as a player’s own game. The best way to familiarize oneself with a particular material or style of basketball is to try it out. When buying a basketball, you will need to consider different aspects, such as outdoor or indoor or both. Size will matter and having a durable cover is key. Always try to get a ball that will meet your skill level of play. It will make it more fun and you will cherish your newly bought product.